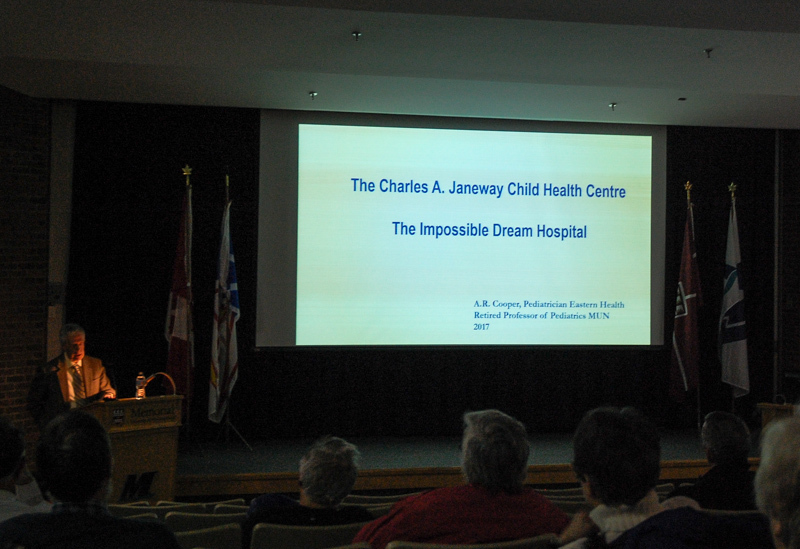 On March 30th, I had the distinct pleasure of attending a lecture by Dr. Rick Cooper titled, “The Janeway Child and Rehabilitation Centre – An Impossible Dream Hospital". 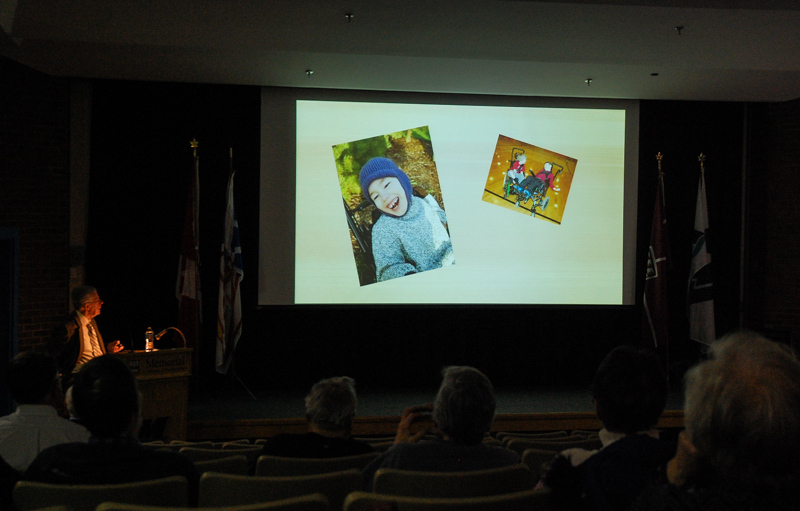 The lecture took place at Hampton Hall in the Marine Institute, and was part of a series of talks presented by the Newfoundland Historical Society. 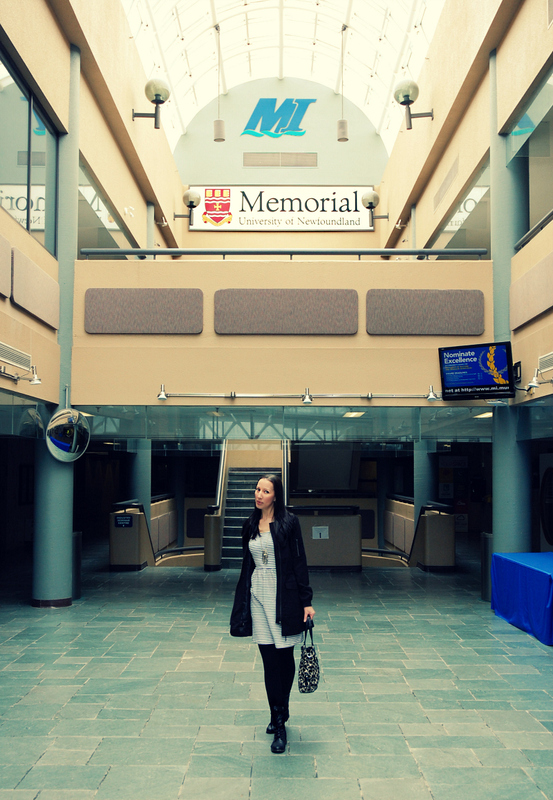 "In August 1966, the Charles A. Janeway Child Health Centre opened and became a referral centre for all sick children in the province and became an affiliated hospital of Memorial University of Newfoundland Medical School. Before Confederation, child health care in Newfoundland and Labrador was below standards when compared to other Canadian provinces. After Confederation some improvements were made particularly in public health but Dr. Cliff Joy, a pediatrician in 1958 felt that the hospital treatment of children was below standard and the province lacked a central referral centre for sick children. He advocated for a central free standing Child Health Centre in the Province. In 1960 the Americans closed Pepperrell and made the base hospital available to the Province. The Newfoundland Medical Association, the Premier, the March of Dimes and the Rehabilitation Community wanted the Pepperrell hospital to be a Rehabilitation Centre. Dr. Joy persisted and because of several events and the support of several prominent Canadian and American pediatricians was able to persuade Mr. Smallwood to make the Pepperrell Hospital a Child Health Centre. In his lecture, Dr. Rick Cooper will trace this story of the Janeway hospital, and the development of child health care in Newfoundland." Dr. Cooper has been a practicing pediatrician at the Janeway for the past 43 years, providing quality pediatric care to the children of Newfoundland and Labrador since 1974. He has conducted extensive research on the development of child health care in Newfoundland, and has a forthcoming publication on the history of the Janeway Children’s Health and Rehabilitation Centre. The Janeway recently celebrated it's 50th birthday (which I wrote about HERE). My family is all too familiar with the current Janeway hospital, and I remember visiting the previous Janeway site when I was young, but I was not aware of the challenges that were initially involved with establishing a dedicated children's hospital here in our province. Dr. Cooper's presentation was fascinating, and his personal connection - not just to the building, but to the people - were what made it so engaging. This man has stories, and I could listen to them for days. My family is fortunate to have had Dr. Cooper play such a pivotal role in our own story. My son, Brennen was born in California in 2005. Soon after his birth, it became clear to me that something was not quite right, but the doctors there dismissed my concerns and sent me away, saying that my baby was "fine" and telling me not to worry. I continued to seek help in California, but was getting nowhere, so after several difficult months, I returned home to Newfoundland to be with my family. Within a couple of days, we got an appointment with Dr. Cooper, and as soon as he saw Brennen he knew there was something wrong. He acknowledged my concerns and ordered a battery of tests, and for the first time since my baby was born, I felt like someone finally cared enough to try and help us. Turns out, Brennen was not fine. He was diagnosed with Spastic Quadriplegic Cerebral Palsy, Seizure Disorder, Global Developmental Delay and Cortical Visual Impairment. Dr. Cooper didn't mince words when he told me that his condition was very serious, and that my child was going to have a difficult life. My heart was broken, but I appreciated his honesty and his gentle, caring nature. I will never, ever forget those early days. They were some of the hardest of my life, but I have to thank Dr. Cooper. Understanding what was going on with my child was the first step to accepting our situation and coming to terms with all that lay ahead for us. I often wonder how things would be today if I hadn't returned home to Newfoundland. How many times would I have been dismissed and turned away? How long would my child have gone undiagnosed and not have received any therapeutic services? How much longer could I have survived the anguish of not knowing what was wrong with my baby? Dr. Cooper is a strong and respected leader in the child health care field, and we are so happy to have him on our side. Dr. Cooper's talk also reaffirmed for me the importance of sharing our stories. His upcoming book contains the accounts of several individuals - patients, nurses and physicians, who share their personal experiences with the Janeway. He says, "It's really important that we tell our stories. Let's face it, the history of surgery is probably a bit boring, but someone's experience at the Janeway is not." We all have a story to tell, and I am using this space to try to change the way the world sees anyone who is different, to accept differences in others, and to accept our own differences that can make us feel inadequate. So please keep reading, and keep an eye out for Dr. Cooper's book, which will be released later this year by Boulder Publications!